In this area of the Apparel Search fashion brand directory, you will find men's fashion brands from leading apparel companies and fashion designers. On this particular page, you will find information regarding men's clothing with the Dockers brand. You are welcome to utilize this section of our clothing guide to review Dockers news, Dockers blog posts, Dockers photos, and more. Please understand that you may run into a few photos or a tad of information that does not actually pertain to the men's Dockers fashion brand. Unfortunately, no search technology is absolutely perfect. We will continue to do our best to bring you as much information about the men's Dockers fashion collection as possible. Dockers is a brand of khaki garments and other accessories from Levi Strauss & Co. Levi Strauss & Co., then specializing in denim, introduced the Dockers brand in 1986. Dockers became a leading brand of business casual clothing for men under the leadership of Bob Siegel. The Khaki pant has been around since 1846 when Englishman Sir Henry Lumsden dyed his cotton pajamas to create a uniform more suitable to the climate of India, thus creating khakis. More than 150 years later the khaki pant has become a casual clothing staple in the office place. The pants have always had a go-with-anything motto that was really embraced by Dockers when the brand launched in 1986. Yes, this clothing brand is more than just Khaki pants. They design shirts, shoes, belts, etc. In January 2010, the Dockers brand launched a cross-channel advertising campaign with the tagline "Wear The Pants." The campaign premiered during the 2010 Super Bowl, and was the first Super Bowl advertisement to offer an exclusive, limited time online offer for viewers. 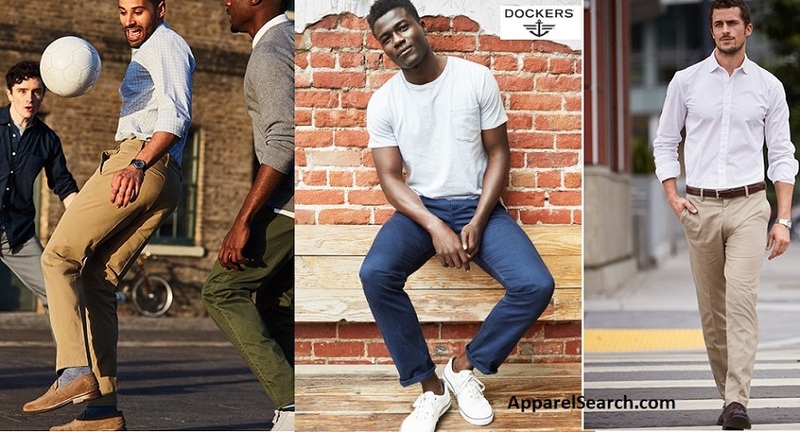 The Dockers campaign tagline, "Wear The Pants" was marketed as a call to masculinity for men. The campaign incorporated outside sources to incite men to reclaim their lost male-aesthetic. Along with a new campaign message, the Dockers brand has since revitalized their product line as well, featuring several new styles aimed at a younger, status-seeker consumer. If you have changed your mind and do not wish to research the brand Dockers, you can use the search engine on this page to find another clothing label that may be of more interest. What ever pants you are wearing today is in style. Dockers led a small revolution to usher comfortable and cool into the workplace. Fast forward to now and you'll find one of the most iconic khaki brands ever. They have been perfecting their craft one great pair of pants, one successful moment at a time. Apparel Search is a leading guide to fashion, style, clothing, glam and all things relevant to apparel. We hope that you find this Dockers page to be helpful.